NEW YORK and TORONTO, Jan. 15, 2019 /CNW/ - The Laurel Hill Advisory Group is pleased to announce that it has been recognized by the Activist Insight 2018 Intermediary Awards as a Top 10 Proxy Solicitation Firm globally. This is the second year in a row that Laurel Hill has been ranked in the Top 10 for its work on shareholder activist campaigns representing both issuers and activists. 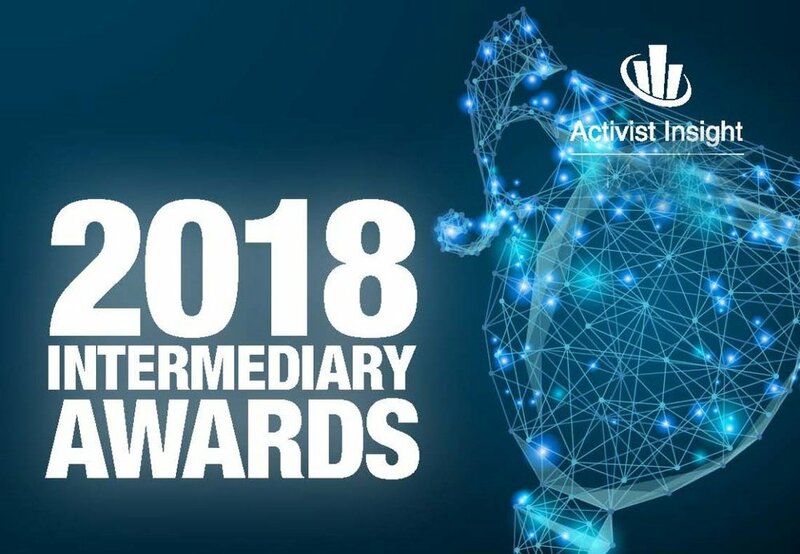 The Activist Insight Intermediary Awards annually ranks both Proxy Solicitation and Law Firms for their work in the field of shareholder activism. Laurel Hill has been ranked 6th globally this year for working on 17 activist files in North America. "We are very proud to be included in the top 10 proxy firms," stated William J. Catacosinos, Laurel Hill's Senior Partner. "Our team has worked very hard throughout the U.S. and Canada to build our reputation as one of the best at servicing our clients' needs and delivering successful results". "We take great pride in being recognized for our involvement, but also for our industry-leading results", added David Salmon, Laurel Hill Canada's President. "Being the highest ranked firm in Canada drives our team to continue to provide our clients with leading advice and strategic guidance to ensure they reach their desired goals." A link to a hosted version of the ranking tables can be found here: https://www.activistinsight.com/research/IntermediaryData.pdf. For any inquiries about the rankings, please contact Activist Insight at info@activistinsight.com. For further information: US: Joseph Contorno, jcontorno@laurelhill.com, (516) 396-7939; Joseph Moran, jmoran@laurelhill.com, (516) 396-7901; John O'Grady, jogrady@laurelhill.com, (516) 396-7905; Canada: David Salmon, dsalmon@laurelhill.com, (604) 620-2224.